Hawaii's police departments issued nearly 550 fewer tickets during this year's "Click It Or Ticket" campaign compared to the one last year. For the period from May 21 to June 3, the Honolulu Police Department issued 1,717 citations; the Hawaii County Police Department issued 365; Maui police issued 315; and Kauai police issued 396. An additional 170 citations were issued for child safety violations statewide, which was up from 60 citations last year. 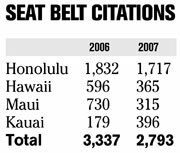 Kauai County was the only county that saw an increase in seat belt citations. This year's total more than doubled last year's count. Hawaii's seat belt laws require all front passengers to buckle up, as well as back seat passengers under the age of 18. Violators of the seat belt laws are fined $92. State law also requires children under the age of 4 to ride in a child safety seat, and violators of this law are fined $100 for their first offense. The Click It Or Ticket campaign is funded by the U.S. Department of Transportation's National Highway Traffic Safety Administration. For more information about the campaign contact the Safe Communities Office at 587-6300 or visit www.hawaii.gov/dot/publicaffairs/safecommunities.